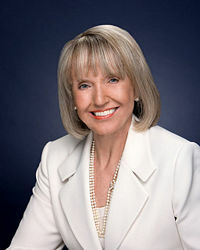 Janice K. Brewer (born 1944), a RINO, is the current governor of Arizona. Born in California, she moved to Arizona in 1970. Elevated to governor on January 20, 2009 upon resignation of Janet Napolitano, Brewer was elected Arizona's secretary of state in 2002 and re-elected in 2006. Maricopa County Supervisor, 1997 - 2002; Arizona Legislature, Senator, 1987 - 1996, Representative, 1983 - 1987. Governor Brewer was best known for standing up against illegal immigration, which hits Arizona harder than any other state. Governor Brewer is married to Dr. John Brewer and is mother of three sons, one of whom passed away in 2007. She is an active member of Life in Christ Lutheran Church in Peoria. Early in her tenure as governor she supported Republican proposals to reduce $1.6 billion in government spending. SB 1070 was signed by Gov. Brewer and liberals immediately reacted in typical rhetoric, blasting Brewer with wild allegations of racism and fake tears for loss of civil liberties, which are not violated. Arizona inherits a larger share of illegal immigration issues than most other states. Statistics put the number of illegals in the state from 500,000 to one-million people or 10% of the population. A weak border is bad defense against terrorist infiltration. Management and legitimate assistance by the federal government continues to be lacking. The bill, here, is seventeen pages in length and basically enforced existing immigration laws that the federal government has ignored or is incapable of providing the resources. Governor Brewer is leading to protect Arizona's population for the sake of its citizens and restore law and order. Democrats and other liberal groups rallied against SB1070 with mob-like protest demonstrations. Some of the main issues in the bill had been contested by the liberal 9th Circuit Court of Appeals. A federal judge's ruling was upheld, leading to the United States Supreme Court taking up the case. Up to 20 states are now presenting laws similar to Arizona's, beefing-up and enforcing current law, instead of illegal immigration decriminalization like the Obama Administration desires. The liberal Hispanic group funded by George Soros, La Raza, had organized a recall effort of Jan Brewer directly tied to SB 1070. The effort fell short in May 2011 by more than 350,000 signatures. Brewer followed up illegal immigration border security legislation by making it a crime to arrest people due to profiling. On June 25, 2012, the United States Supreme Court ruled in Arizona v. United States, in a split decision, that three of the four major provisions in SB 1070 were unconstitutional. Judge Andrew Napolitano, a law analyst for Fox News, stated, "The heart and soul of the Arizona statute has been struck down by the Supreme Court, consistent with previous Supreme Court opinions that basically say for better or for worse whether you like it or not immigration is a federal issue to be administered by the United States of America by the federal government and not by the states." Jan Brewer has signed into law a package of pro-life bills that would limit abortions by banning the partial-birth abortion procedure. Passed legislation that mandated twenty-four hour waiting periods before an abortion could take place. In 2014, Brewer vetoed a Religious Freedom bill after succumbing to pressure from homosexuals. ↑ Arizona Immigration Law 'Heart' Struck Down by Supreme Court foxnews.com, Fox News Latino, retrieved June 25, 2012. This page was last modified on 9 April 2019, at 10:41.